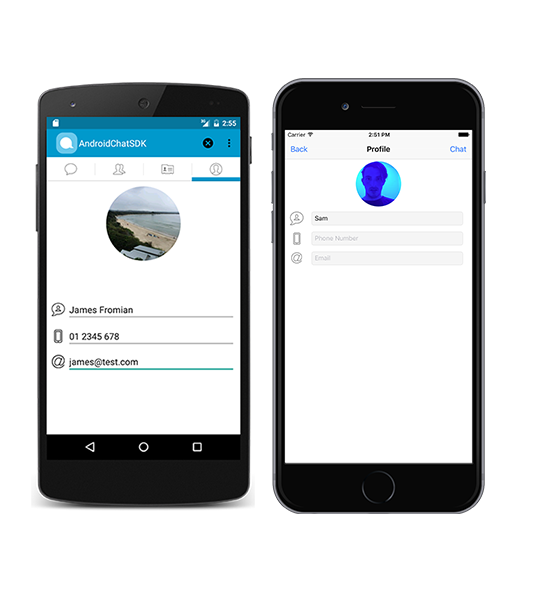 Allow users to create private and group chats. There’s no limit on group size and private chats can be converted into group chats simply by inviting a user. Login using an email, Facebook, Twitter or anonymously. You can also authenticate with your existing server using custom authentication. Targeted push notifications are supported out of the box. This means that users will never miss a message. You can also easily support your favourite push provider. Standard user profiles include a name, avatar, email and phone number but this can easily be extended by adding custom meta data to each user. The complete source code is provided with every license. The source code is well commented and documented and easy to modify. All of our licenses come with a 2 week money back guarantee. Just drop us an email and we will process the refund. We only want you to use our code if it provides you with value and fits with your project. A flexible search feature makes it easy for users to find their friends. The open API also allows you to add your own custom search indexes. Allow users to create public chat rooms. Create themed rooms to allow users to get to know each other by discussing a particular topic. Versions are available for iOS and Android. Both versions are complete inter compatible out of the box. The SDK supports text, location, image, audio and video messages. You can also easily add your own message types. For example, our clients have added quiz message types and stickers! 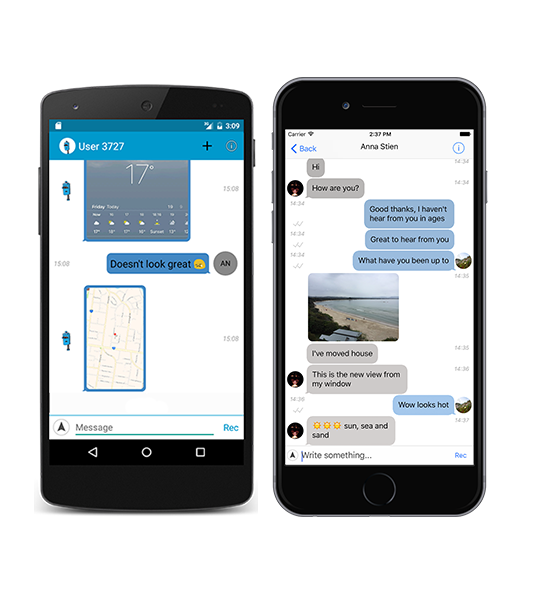 Chat SDK is extremely scalable. We have customers with millions of downloads who are supporting over 100,000 daily users with no trouble. A users complete message history is stored in the cloud. This means that if they lose their device, their conversations and groups can be easily resynchronised. You have complete control over the app from end to end. From the client and server source code, to the message data. We provide an excellent level of support and have someone available 24 hours per day to answer your queries. We try to answer support tickets in minutes rather than hours. Extremely flexible authentication options users can login with their email, Facebook or Twitter account as well as anonymous login! If you have an existing server, login automatically using a custom authentication token. Allow your users a greater range of expression with image messages. Images are clickable and open full screen. Users can also post their current location. Clicking on the location opens an interactive map with a pin marking the location. User profiles include all the basic information – avatar, name, phone number and email. Profiles are also easily customisable. Add custom meta data to a user and it will be synced to every device automatically. The contacts page includes a powerful search functionality. Users can find their friends by searching for their name, phone number or email address and the results are displayed in real-time. 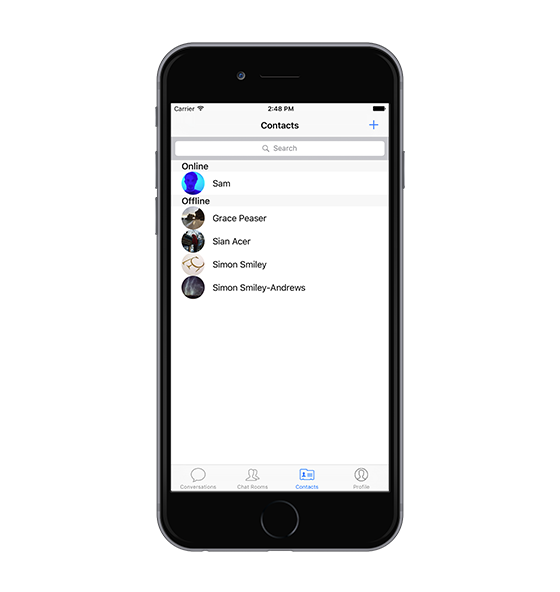 Check out the contact book add-on to automatically populate the contacts from the phones address book. 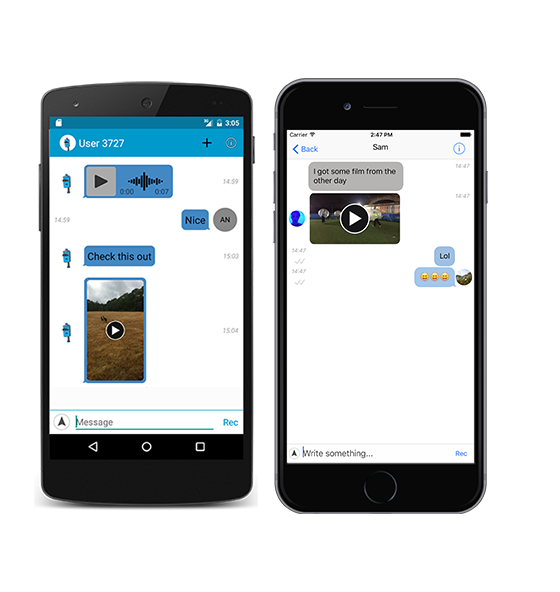 The audio and video messages plugin allows users to record and send rich media either straight from their camera or from their library. Audio messages can be played using the interactive player widget and videos can be played back in a full screen view. Badges and update indicators allow the user to easily see when a new message has been posted on a thread. If the app is closed, a push notification will be sent posting an alert on the user’s home screen. Improve user engagement by adding the typing indicator and read receipt add-ons. Users are more likely to reply to a message if they know that the recipient is waiting for a response. 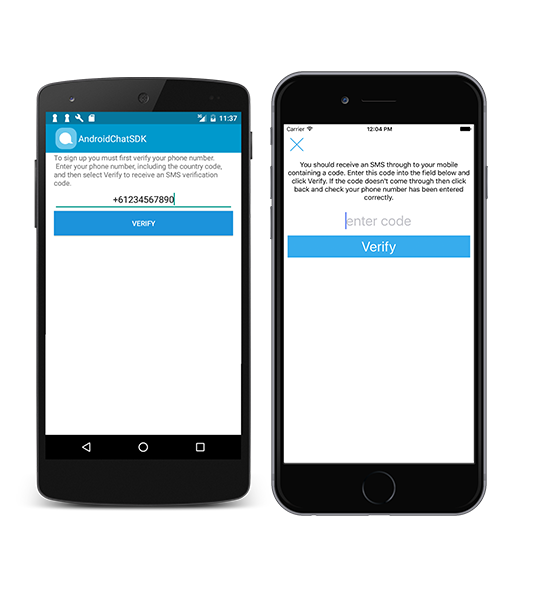 The two factor authentication add-on allows user to login using their phone number. The module comes with a stand-alone server that handles SMS verification as well as phone number change and account recovery. 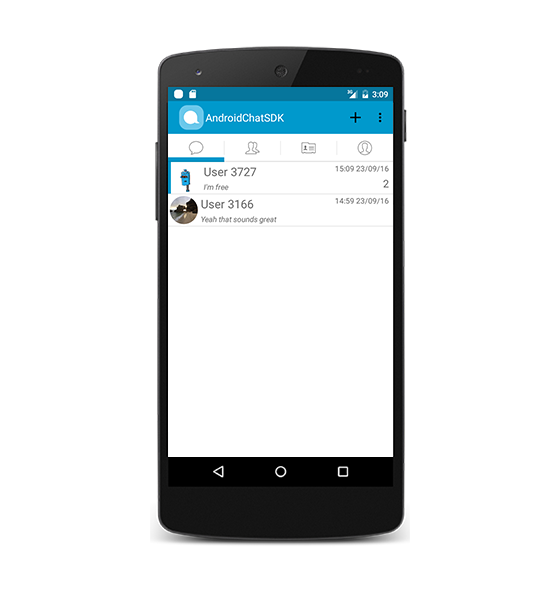 The location based chat module provides a new list view which shows which users are online nearby. This would be great for any location aware and is especially suited to dating apps. The stickers add-on allows your users to send stickers in the thread using an interactive “sticker” keyboard. You can add any number of sticker packs. 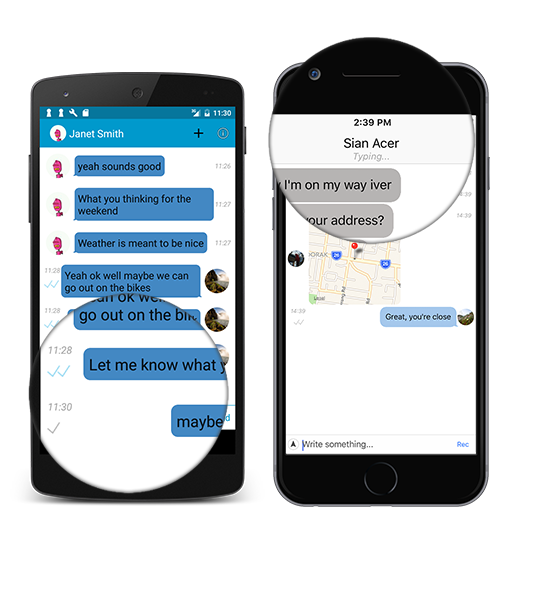 Stickers are a new message type so the app saves bandwidth by only sending the sticker ID. We get asked all the time about server hosting fees for the Chat SDK. We’ve worked with clients at many different scales from several thousand monthly users up to over 500k daily users. Below we’ve tabulated how much we think you would pay in terms of Firebase hosting fees per month as the app scales. For further reading, we have also done a more detailed analysis of the cost of different hosting options here. 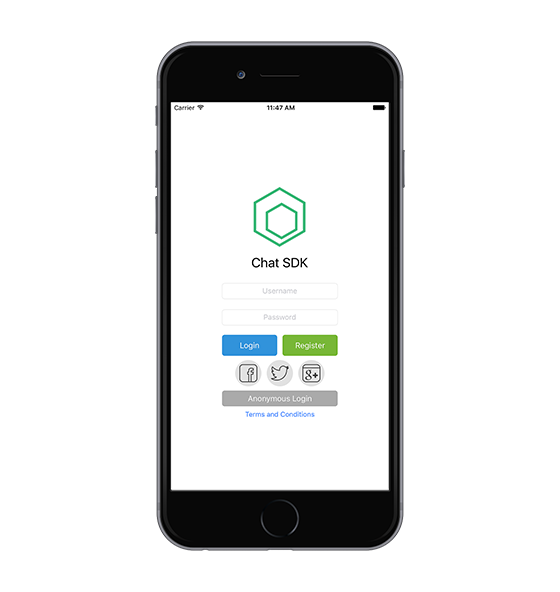 Chat SDK powers apps with millions of downloads and hundreds of thousands of daily users. There are a range of addons that can be purchased to enhance your chat app. Allow your users to log in securely using their phone number and SMS validation. Users can also recover a lost account and change their number. View a list of users who are located nearby. This is very useful for dating and social chat apps. Add your custom stickers to the chat and boost revenue. You can add multiple sticker packs which the user can select from a dedicated sticker keyboard. Users get notifications when their messages are delivered and when they are read. Read receipts boost engagement because it encourages users to reply soon after reading the message. Allow a user to load their contacts from their addressbook. This works very with two factor authentication because users can be searched for using their phone number. Users get a notification when another user is typing. Typing indicator supports single and group chats.